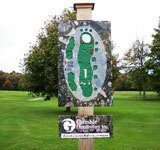 Carlowden Golf Course features a challenging 18 holes spanning over some of Northern New York’s finest scenic countryside. Located just 15 minutes from Fort Drum and 25 minutes from Watertown – Carlowden provides easy access to some of the finest golfing in the north country. Coming down the hill from from the club hose, past #9 green is this straight away par 4 that allows the player an opportunity to begin a round of golf on a great warm up hole with a forgiving green. A short, straight par 4 that invites a big drive that the longest players can reach. A birdie can be had, but you need to note where the pin is so as not to short side yourself. A relatively short par 3 with the smallest green on the course. This devilish little green has a distinct left-to-right slope and grain. A bogey can be a great score here. This par 3 elevated postage stamp can be very elusive, especially when windy. You have to pay close attention to pin location. Short siding yourself here can lead to bogey or worse. Hitting long here is a definite no-no. A very short dangerous par 3. A good thought is to play for the front half of the green. 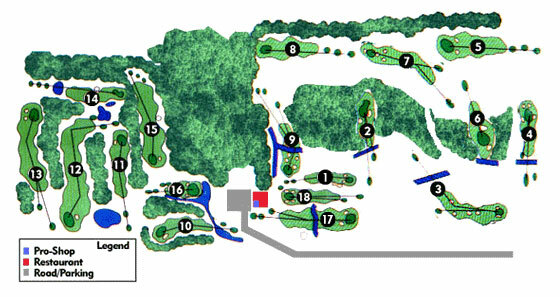 This dogleg left, par 5 incorporates numerous man-made grass swales and hillocks. 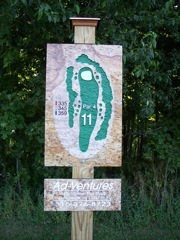 After threading through these, one has a friendly, large green target that holds well as the slope favors the golfer. This par 5 doglegs left then goes downhill. Experienced players can draw the ball around the corner or go over the trees slightly. Average players should hit it left center. It is important to elude the mounds and the grass bunkers on your second shot. Long hitters have a chance to reach the green in two shots. Pin location can be important in order to play for a good angle for your third shot. 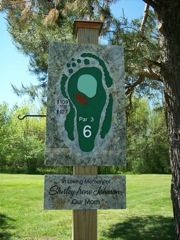 A more lengthy par 3 whose character is its green. A narrow approach to the green is a bridge between two tricky grass swales. Other swales are found by the unfortunate few who are either long or right of the green. This bowl shaped green is exciting when the pin is toward the rim of the bowl, as the slope and grain make putts break 90 degrees. On this par 3, a straight tee shot is imperative. The green is bowl shaped and has deep grass bunkers on the right and drops off severely on the left. 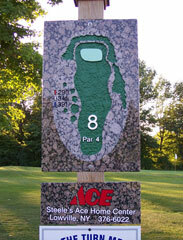 On this hole, pin position is important in order to not short side yourself, leaving little chance of making par. This par 4 has discouraged many as one stands on the tee. The prevailing wind is in your face and the entire fairway is uphill. The two-tiered green is protected by a formidable upswale that deposits approach shots, which are only inches short, to its base. 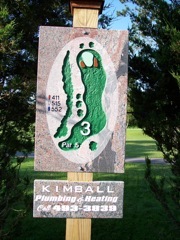 A straight uphill par 4 with a wide fairway and rough. A good drive will set up a short iron to the green. The 2 tier green is guarded in the front by two extremely deep grass bunkers. A back pin position is very tough to get at. The green is very fast from back to front with the grain growing downhill toward the valley. A short 118 yard par 3 from the whites with a challenging green protected by a sand bunker left front. This short par 3 can grab you. The hole is deceptively downhill as the tee doesn’t appear as elevated as it really is making club selection challenging. The green is small and guarded by a sand bunker on the left. A well struck shot hitting past center of the green could well go over the green and down a steep embankment leaving par next to impossible. Play for the center front edge no matter the location of the pin. A very interesting short hole. The tee shot on this par 5 can take many forms. Cutting off many yards by hitting driver from the tee means hitting over a wall of trees (for the men). A safer route lengthens the hole but allows for safety and a birdie is still possible. Study of this green and experience are a must. This par 5 dogleg left can be had with a good tee shot. Experienced players cut the corner and hit over the trees. The trees are close, so you have to get the ball up quickly. It takes some experience to know how much you can cut off and still have a playable second shot. Average players should play an iron straight out. From there, the hole is straight forward some 350 or so yards. The green is sloped back to front and is down grain and fast in that direction. This par 4 is the number one handicap hole for many reasons. Similar to #5 in many ways it is also significantly longer and the green is more severe. It is beautifully framed by trees, which do come into play. 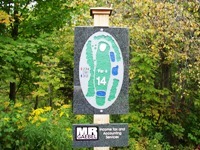 The number one handicap hole is a straight par 4 that requires a solid tee shot to get near the 150 yard markers. The normal wind is usually in your face making the hole play much longer uphill to the 2 tier green. Many players choose to lay up short of the hole to insure a better placed shot on the green. Even with that, a 5 is often a good score. Hit your approach over the green brings double bogey or worse into play, as does being on the upper tier when the pin is on the lower tier. 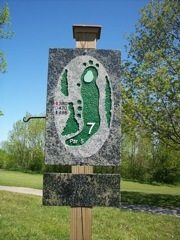 Like #7, this hole has a variety of tee shot options. 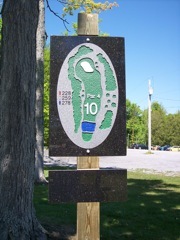 A driver will carry the creek and leave a half-wedge to another bowl-shaped green. A mid iron will leave a short iron. The green is tilted slightly right to left and back to front making judging putting breaks a challenge. This shortish par 4 doglegs to the right favoring the player who fades the ball. 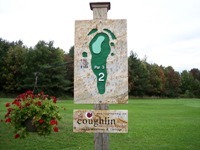 It is distingishable by a water run off ditch that crosses the fairway about 200 yards off the tee as well as running along the right edge along the tree line. Staying left is imperitive. A good player may choose to drive over the ditch, putting a wedge in your hands., You can also play safe with a mid iron that leaves a shot of 100 – 150 yards in. The green is guarded in front by a large sand bunker and on the left by a very deep sand bunker. The “new nine” (as some still call it) starts here. #10 is an uphill par 4 protected by severe grass swales in front of another two-tiered green. This beautiful hole is framed by mature trees. This uphill par 4 is very narrow making club selection at the tee important. The proper way to play it is with a mid iron through fairway wood – a club you can accurately hit about 200 yards. This should put you at or inside 100 yards. From there, it is uphill again to a narrow, very hard to hit 2 tier green. A tough, short par 4 to start the back nine. This par 4 also offers distinct tee shot options. The fairway narrows at the 100 yard mark with mature, unforgiving trees. The largest green on the course offers a most inviting target. Probably as straight forward a hole as we have at Carlowden. The tee boxes tease you to grip and rip it, but danger looms left and right in the rough and trees. A good drive will leave you 120-140 yards. Everything is in front of you. The infamous ‘double-dogleg’ par 5 plays differently from each tee box. A well-placed second shot over trees could lead to an eagle, but an errant shot means a lost ball. Two well-placed irons will require only a wedge to the elevated green. 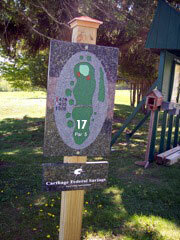 This par 5 is one of the more controversial holes at Carlowden. It’s called the zig-zag hole, among the cleaner names. It requires 2 lay ups. From the blue tees, play your first shop straight out 180 yards; then the fairway doglegs left requiring another layup of about 150 yards to get to 100 yards where the hole dog-legs back to the right to the smallish, narrow green that is fast back to front and left to right. 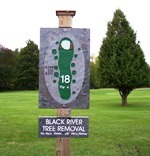 From the white tees, an adventurous golfer might try to cut the corner or hook the ball around the trees, which would leave a shot of 200+ yards with a carry over some pretty good sized trees to reach the green in two. Again, tee shot options vary for this slight dogleg par 4. Accuracy is a must as there is OB left and trees to the right. The green offers an elusive target. 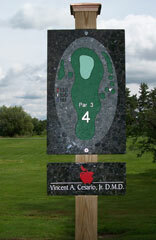 Many consider this hole a major stumbling block to a good round. The tee shot on this par 4 is blind and conceals some landing room on the right. There is out-of-bounds on the left which is very much in play. Members generally play over an apple tree which is about 150 yards off the tee. The fairway loglegs somewhat to the right. A good drive can run down the hill to about 100 yards. The approach from there is straight forward with no surprises. 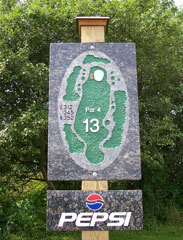 A relatively short par 4 features a mound in the middle of the fairway and a few around the green. A small pond on the right will swallow aggressive tee shots. Aggressive approach shots will not stop on this green and the nearby woods behind the green will swallow them up. This narrow par 4 can be reached by the longest hitters, but at risk of a lost ball or worse. Carlowden players lay up with a hybrid or iron to 100-125 yards. From there, the approach is again, very straight forward to a long narrow green. Arguably the most picturesque of all par 4s this slight dogleg right is well framed with tall trees. Grass mounds and a sand trap guard the green to the left. Long is dead here also. This dogleg right requires a very straight drive and is tree lined on both sides. A mound on the left about 220 yards from the tee can aid in aiming your drive. Some players hit at the mound with a fade, while others hit it over the edge of the trees on the right. There is more room on the right than is visible from the tee. A second shot after a good drive leaves 140-170 yards straight ahead to an inviting green. The sand trap on the left and hitting long over the green are no-no’s. The green breaks back to front and left to right. A birdie is a real possibility, and a score of par is very satisfying. 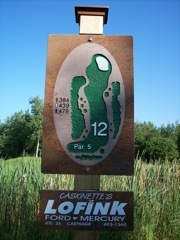 This par three is thought to be a singnature hole at Carloweden. This 155 yard par three reveals majestic vistas of the Adirondack mountains from the T and a sloped green is surrouned on one side and the back by water with two sand traps protecting the approach. This par 3 measures 170 yards from the blue tees. Touted as Carlowden’s signature hole, you can see the Adirondack foothills some 30 miles away. Even though the yardage says 170, the dramatic downhill hole plays shorter. Club selection is challenging. Indecision whether to hit it high and hope for pin-point control, or hit lower and run it up can lead to bogie or worse! 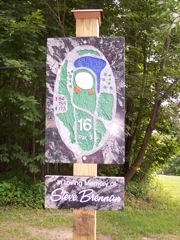 The green is a nice heart shape with a pond behind the green. The only safe miss here is short. A straightforward par 5 with out-of-bounds to the right. Many have faded their initial tee shot “over the road” only to restart their round with their third stroke. The green is protected by a sand trap and is difficult to hold, at times, as the grain goes front to back with only a little left-to-right slope. 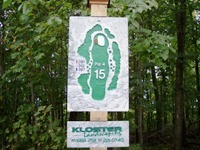 The finishing hole offers one last uphill challenge. The grass swales in front are tame compared to the sand traps right and left of the green. This diabolical green can produce four-putts or worse. It’s slope and grain work in the same direction. Thankfully, the clubhouse is near. What you see is what you get. This longish par 4 is usually played into the wind. A good drive will place you 130-150 yards out. The green is guarded by two grass bunkers in front and deep sand traps on both sides. Those aren’t the problems! This green is severly sloped from back to front and can be next to impossible to 2 put from above the hole. Many have stood helplessly watching their downhill put roll off the green. Next to the scenic 16th hole, #18 is probably the most talked about.